After putting in three long, hard, grueling weeks of training camp at Leigh University, the Philadelphia Eagles officially say goodbye to Bethlehem. One player that was thrilled to be heading back to the friendly confines of the NovaCare Complex was WR DeSean Jackson. "Bye-bye, Lehigh," Jackson said " See ya, wouldn't wanna be ya." Of course no player likes staying in the dorms or being away from Philadelphia, but the time spent up there will pay off for the extremely young team. Additionally, training camp is where team's come together and become one. “I think that built a foundation," Reid said. "In particular, a young group, and I think they need to be introduced to what the National Football League is all about. It’s faster, there’s more pressure put on you mentally and physically than what you had at the college level, and there’s no better place to figure all that out than right here." While training camp is no fun for the players and the veterans hate it more than anything, it has importance. ** First the good news on the injury front. CB Ellis Hobbs returned to practice on Wednesday after missing yesterday with an undisclosed illness. He is expected to start on Friday against the Bengals. He will have a tough matchup against either Terrell Owens or Chad OchoCinco. ** Two more players from the secondary practice today in S Quintin Demps and CB Macho Harris. Both are going to play on Friday. Harris is an intriguing player to watch during that game. Not sure if rookie CB Trevard Lindley has moved ahead of him on the depth chart. ** Finally some good news for TE Cornelius Ingram. He was not limited in practice and made it through the entire practice without another hiccup. He still is behind Clayton Harbor on the depth chart, but if he plays well on Friday could move his way back up. ** Some bad news is that CB Asante Samuel and RB Mike Bell have been listed as questionable for the game at Cincinnati. The Eagles have not seen what Bell has been able to do since he has been injured all camp. Martell Mallett is really making a case to be the No. 2 back, but Bell is probably secured of spot. As for Samuel, his hamstring injury is not considered serious. ** The players who are definitely out for Friday’s game according to head coach Andy Reid are Todd Herremans, Jamaal Jackson, Nick Cole, David Pender and Victor Abiamiri. For Cole, he might have lost the starting center job this camp and his knee does not appear to be getting any better. Kurt Coleman-- When Coleman was drafted in the seventh-round most experts and fans believed he was a real sleeper. However he quickly fell behind since the NCAA rules did not allow him to attend the Eagles OTAs in the spring. However, once he got to Leigh, he showed why he was such a great player at Ohio State. He constantly made plays, was around the ball and showed his physical nature. On top of that, he has a excellent grasp of the defense and has been the Eagles best player on kickoff coverages. So far, he and Riley Cooper look like steals for the Eagles. Chad Hall-- Nobody expected the 5-foot-8 Hall to even have a chance to make the roster. Yet, he is right in their battling for the No. 5 WR spot on the Eagles. The Eagles have utilized his speed and ability to find open holes in defenses. More importantly, he is able to return kicks and punts, which makes him a valuable asset. If the Eagles cut him, he might not make it to their practice squad. He reminds many scouts of Wes Welker coming out of college. 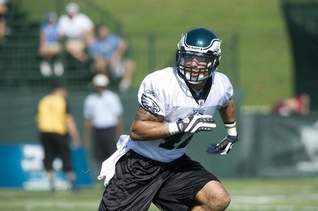 Riley Cooper-- An afterthought when the Eagles drafted him in the fifth-round, Cooper has been one of the best rookies in camp. He started off camp with a bang as he got into a fight with veteran Ellis Hobbs. Since then all he has done is let his play do the talking. He made several big receptions in the Eagles preseason game. But he really starred in practice, as he was nearly unstoppable running a slant or crossing routes over the middle of the field. Additionally, Cooper is extremely physical and allows the Eagles to finally run the fade route in the end zone with success. It would be shocking if Cooper were not the No. 4 WR on the depth chart for the Eagles matchup against Green Bay. Brandon Graham-- During the draft, Eagles fans were screaming for S Earl Thomas, but now they see why the Eagles took Graham instead. DC Sean McDermott has lined Graham up all over the field. He has played inside, outside and is already starting on the nickel package. Furthermore, he is relentless every time he steps on to the practice field. He is eventually going to replace Juqua Parker as the team's starting left defensive end, but the question is how soon. Martell Mallett-- Mallett has had a very weird camp. 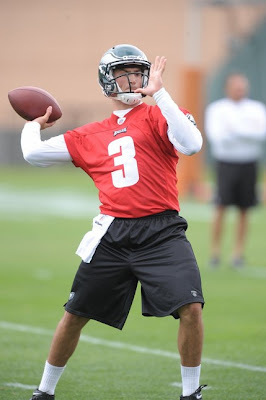 He was cut at the beginning of camp and then the Eagles brought him back a few days later. Since then, he has made the most of his opportunity. 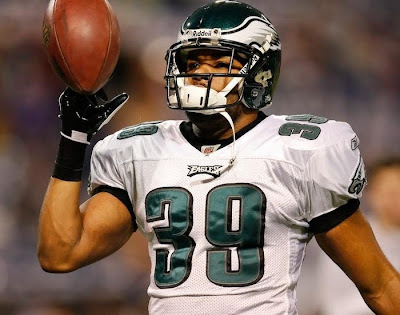 In the Eagles first preseason game, he led the club in rushing and showed his ability to catch the ball out of the backfield. Why Mallett has a tough task of beating out J.J. Arrington and Mike Bell, he has been the more impressive back in camp. In fact, he would be a great compliment to LeSean McCoy. His game is very reminiscent to former Eagle Correll Buckhalter. Akeem Jordan-- The biggest surprise at training camp might have been Jordan starting over Fokou at SAM linebacker. All offseason, Reid and the Eagles coaching staff said that Fokou would be the starter. Once camp began, Jordan was placed at SAM linebacker and has never looked back. Remember, Jordan has very good cover skills and before his injury last year he was the team's best defender. Ellis Hobbs-- When the Eagles dealt Sheldon Brown to the Browns, Eagles fans expected the team to draft a cornerback high in the draft. When the Eagles did not take a corner until the fourth-round, the job became Hobbs to lose. Hobbs has not disappointed. Coming off of neck surgery, Hobbs took every snap seriously, was not afraid to lay a hit or jam receivers at the line and made plays in coverage. Hobbs has really opened a lot of eyes during camp and he might be the most improved player on the team. Additionally, he seems to have better speed than Brown with the same kind of physical presence. Trevor Laws-- While the Laws hype has lessened as camp has gone on he still has been light years better in his previous two seasons. Law is in the backfield making plays and seems to understand this is his last shot. That fear might be enough to make the squad and be a key rotation player along the line. Austin Howard-- There is always one rookie free agent that makes the Eagles roster and this year it is going to be Howard. 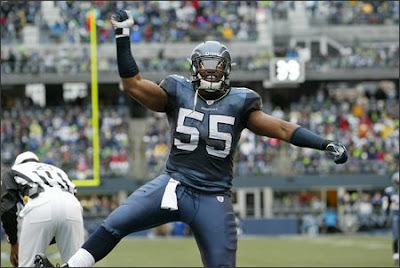 Howard was mauling and destroying defenders in the first preseason game. At practice, it has been much of the same. Howard is very similar to Jason Peters. He was a tight end converted to tackle and has shown the strength and athleticism to be groomed into a solid starting left tackle. It would surprise no one if Justice struggles this year that Howard replaces him next year or is at least in competition. Ernie Sims-- One of the most under the radar moves of the entire offseason in the NFL was the Eagles acquiring Sims from the Lions for a mid-round draft pick. The former top 10 pick appears to be finally reaching his potential and thriving in the Eagles scheme. In addition, he can make plays in coverage, which the Eagles lacked over the past couple of season. If he can stay healthy, he makes Bradley and Jordan that much better. Stewart Bradley-- While Bradley did not do anything spectacular. All he did was make it through camp and showed flashes of his pre-ACL injury form. He is a huge addition to the Eagles. Clayton Harbor-- Heading into camp, Ingram was expected to be the No. 2 tight end on the depth chart. However, Ingram's knee and Harbor's ability to quickly learn the offense has given him the lead. Also, the Eagles love the work ethic that he displays. Plus he has all the tools to be a very good tight end in the NFL. Mike Kafka-- Kafka got high praise as Marty Mornhinweg said he was the best rookie he has worked with over the last 15 years. Besides that, Kafka has shown it on the practice field and in the preseason. He went through all of his progressions and rarely made a mistake. Down the road, it would not be surprising if the Eagles trade him like the Falcons did with Matt Schaub. Mike McGlynn-- Before camp, the starting center position was wide open. Today, it looks like McGlynn will be the guy unless Jackson is able to play and play at a high level by week one. McGlynn has had a good camp, but his stock really went up due to Cole's knee injury. Eagles team-- No major injuries at training camp. 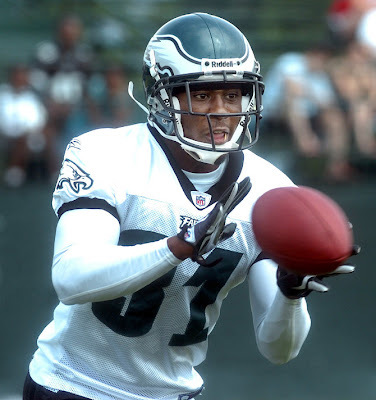 Darryl Tapp-- When the Eagles traded for Tapp, they envisioned him as the starting LDE. Today, he has gotten lost in the mix and is currently the backup for Trent Cole. Tapp's camp seems eerily familiar to the guy the Eagles gave up (Chris Clemons) to get him. 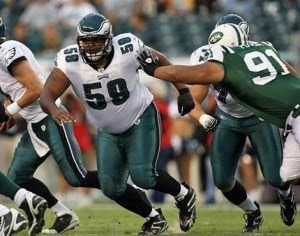 Ricky Sapp-- The player that everyone thought would be the steal of the draft for the Eagles was Sapp. Sapp was expected to be a late first/early second round pick that fell to the Birds in the fifth. Unfortunately, Sapp did not make the impact as a speed rusher and could not cut it at linebacker. The Eagles have a history of putting rookies on IR who were injured in college and Sapp could be that guy this year. 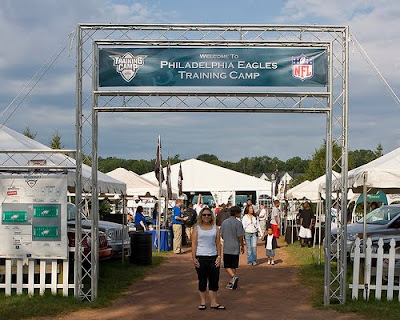 Hank Baskett-- Entering camp, Baskett was penciled in as the Eagles No. 4 wide receiver. As of Wednesday, he might not even make the club. Injuries have derailed him, but even before he was sidelined, Washington and Cooper were just better players. It just feels like Baskett is a long shot to make the roster. Joselio Hanson-- Yes it was just one preseason game, but it has been a trend since he returned from his four-game suspension. He looks like his confidence has been shattered and he is a liability as the third corner in the nickel package. Moreover, Trevard Lindley is making a strong push and could overtake him by mid-season. Moise Fokou-- The biggest mystery at Eagles training camp might be how Fokou lost his starting gig. Fokou has been lined up at DE and at SAM, but he has not been great or bad at camp. Maybe the Eagles feel that they cannot trust him not to commit a stupid penalty. Cornelius Ingram-- Heading into camp, Ingram had high expectations and so did the Eagles. Now, Ingram is dangerously close to being cut. His knee is still a problem and Harbor has clearly beaten him out for the backup tight end job. This is unfortunate seeing as Ingram has the talent to be a very good player if he could just get healthy. Nick Cole-- Cole came to camp and did everything that was expected of him to earn the starting center job. Then he injured his knee and missed the next 2 weeks of practice. Everyday he misses McGlynn takes another giant step towards becoming the starting center. In fact, the first preseason game might have locked it up for McGlynn. He was extremely effective. King Dunlap-- It is hard to imagine Dunlap making this team with the way Howard is playing. Dunlap has a ton of potential, but like he did in college, he has regressed since his first season. Mike Bell-- Everyone expects Bell to be the Eagles main backup at running back. However, Bell has not made it onto the practice field due leg issues. While Bell is a lock to make the club, Mallett is making a strong case to be the No. 2 back. Juqua Parker-- This is not because Parker has been awful at camp. He actually has been pretty good. Nevertheless, Graham has been playing at such a high level it is going to be impossible to keep him off the field. Red zone offense-- The first-team offense started to get it going yesterday in practice, but they cannot keep settling for field goals with the amount of high-powered offenses on their schedule.